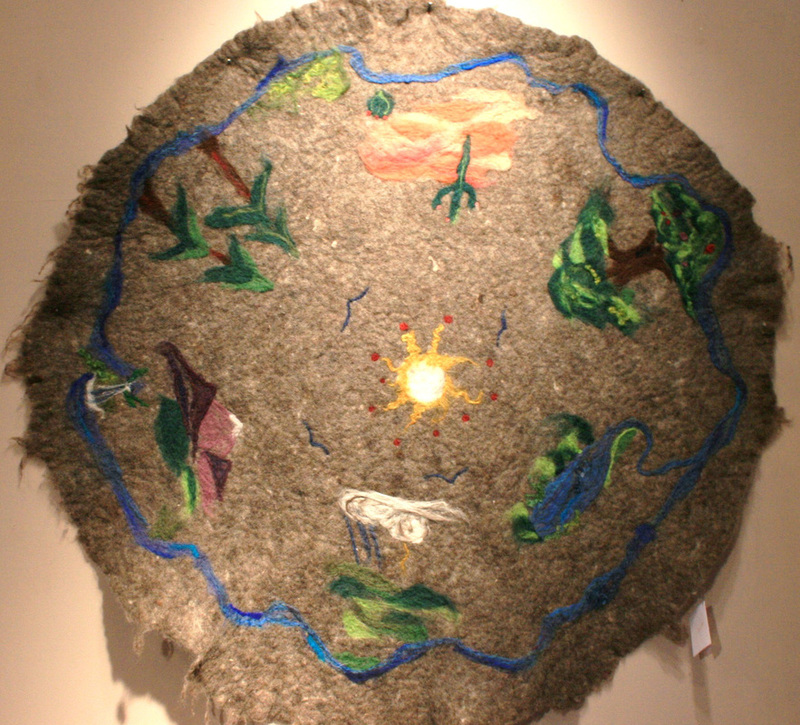 Beautiful things made of felt. Designed, patterned, and crafted by Liz Dwyer. Photos hardly do justice to the deliciousness of wearing or touching these ones. Scroll down to see definitions and descriptions of technique in the Glossary of Terms. 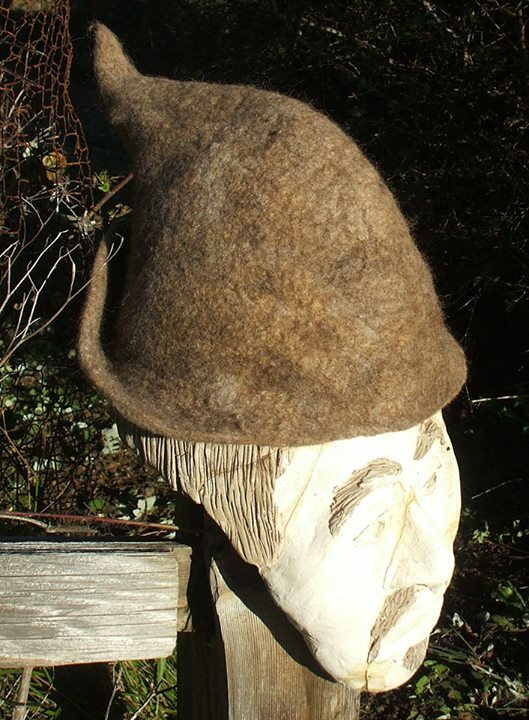 Felt: Felt is a non woven material, similar to leather and paper, in that the fibers that compose it, in felt's case, typically sheep, camel, and goat fibers, are in a kind of chaotic matrix. Simply put, fleece is fluffed (ex. carded) and then layered, one layer perpendicular to the next, until desired thickness and shape is achieved. Then the wool is wetted with some kind of alkaline solution to swell the fibers, traditionally whey was used, left over from sheep's milk cheese-making, now we use soap. Then friction is applied, softly at first, then crescendo-ing into impressively firm manipulation. Once the fibers have formed a cohesive structure throughout the piece, the work is then Fulled (see shrinkage). 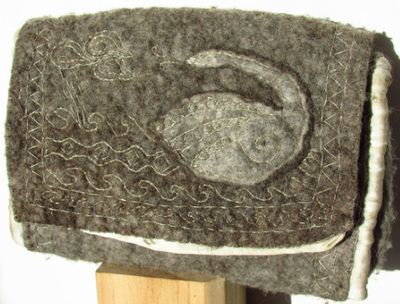 Traditional felt-making has nothing to do with boiling wool, or knitting. Shrinkage: Wool does not shrink. That would be a miracle of physics. No, instead, a wool fiber is essentially a strand of barbs, like fishhooks. Think of human hair, and how when you run your fingers down the strand, away from the scalp, it feels smooth, and if you run your hands up the strand, toward the scalp, it feels rough. Those are the barbs, or scales. In felting the fiber's cortex (the middle) is wetted and caused to swell, thus opening all those scales, extending the fishhooks. As friction is applied to the wet fibers they slowly work their way in and out of each other, like tying themselves into knots. And because of those scales the fibers cannot untie themselves, like ratchet straps or zip ties. 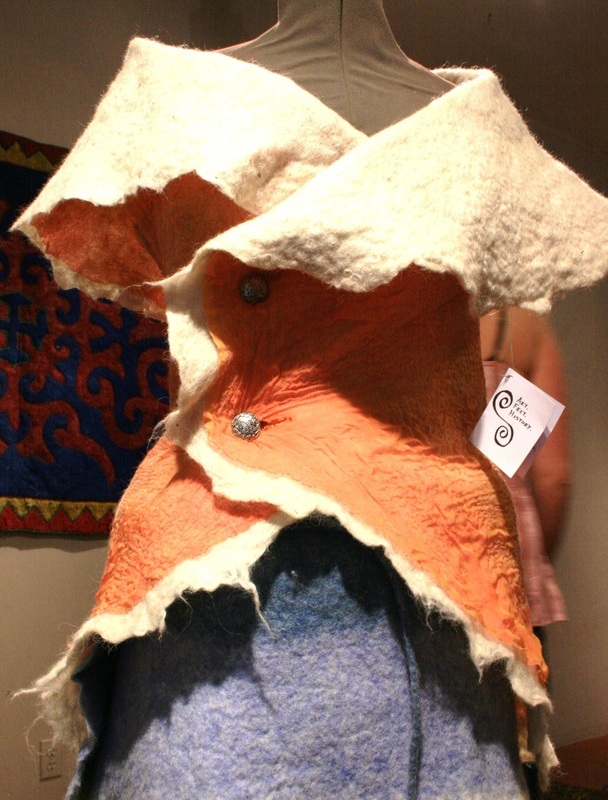 And when the last stage of felting is performed, fulling, the force of friction increases and all the space between the fibers is minimized, the knots are tightened, and the piece appears to have shrunk, leaving a nubbly texture. This also means a completely felted/fulled item will not shrink when washed, because that process was completed in the items creation--unlike that favorite sweater your sweetie stuck in the washer. Needle Felting: A long, barbed needle is used to force fibers to interweave. It's generally recommended that needle felted items are still wet felted after the design is placed, giving it a bit more durability. Navajo Churro, Romney, Corriedale, Gotland, Icelandic, etc. : These are all breeds of sheep. Not all fleeces are created equally! Some breed's fleeces felt much better than others, shrinkage rates can be very different, durability, softness of feel, all of it can be very different from sheep to sheep, and breed to breed. Lamb's wool is much finer than ewe's wool, and behaves quite differently. Resist Method: A technique used for making some kinds of hats, slippers, mittens, etc--any object made of one piece with a hollow space. 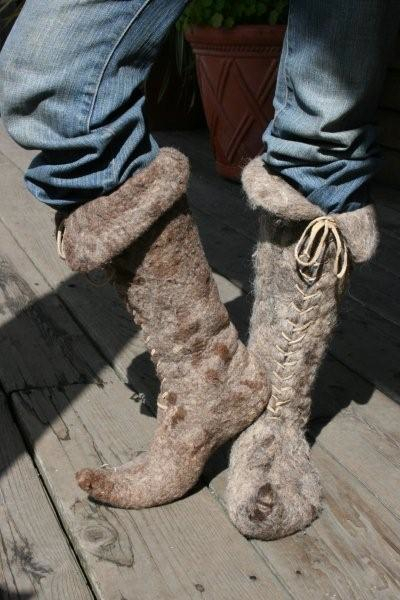 Wool is layered onto and around a pattern made of some non-felting material (something that resists the urge to felt) in the general, albeit much bigger, shape of the end product (the pattern for the boots shown above looked like a large profile of a pointy-toed boot). 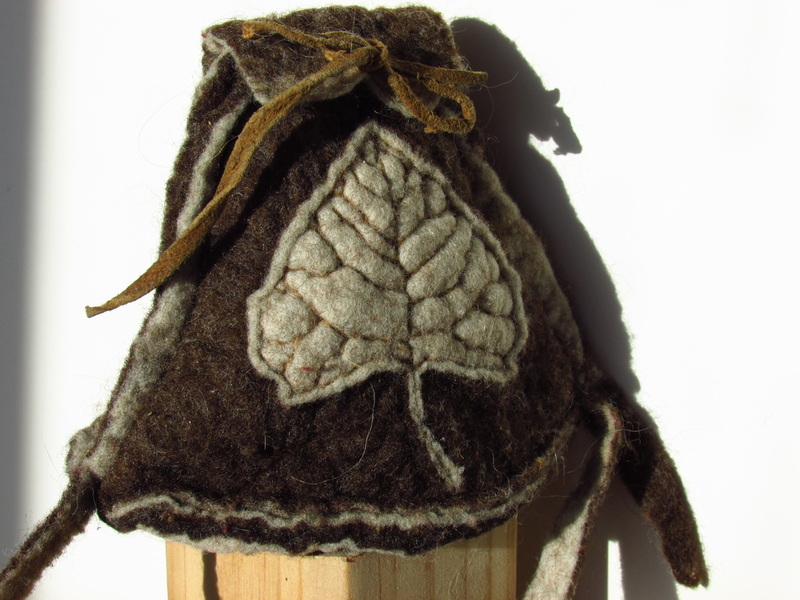 The wool is then felted as usual. Then the partially felted wool is cut along a strategic line to release the pattern--for hats, cut along the brim, mittens and boots, cut the slit where your hand or foot would enter. The item will then have to be fulled. Thus an emptiness is left behind, and the finished product does not require stitching.